As promised, this is the first installation of my painting process. Firstly I decide what to paint. This particular series is for a client of mine, who is graciously allowing me to display my work at their place of business. 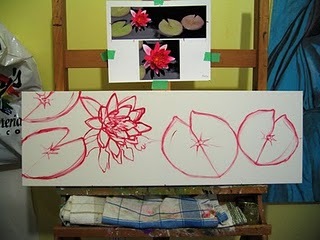 We had a consultation and it was decided that my idea of having a series of waterlilies would work best. I created a layout for their space and pitched the idea of waterlilies. I’m glad the idea passed as I’m very excited to be painting all these beautiful flowers! My next step is to gather images that I think would work as paintings. Luckily I have a slew of waterlily photos that I can see working as paintings. Almost all of my reference images are from my own private stash of photos. *when I illustrate I usually combine images that I find on the net with my own reference shots. I then determine canvas sizes. I do this after looking at the image. It usually “tells” me what will work best. Sounds bizarre but sometimes images only look good smaller than life and other times they only work if painted larger than life! Generally the rule is life size or smaller. I decided that for this particular series since it’s to be displayed as a group, the canvas sizes and image sizes should remain relative to each other. Without getting into the specifics, which might just confuse at the moment, I will only briefly touch on the final wall layout. Pink Waterlily is the archetype, as it will be the maximum height of 24 inches. 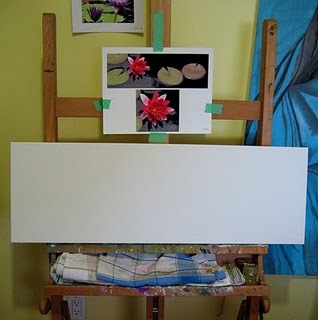 Red Waterlily and another painting entitled White Waterlily will be 10×30 inches, making them the widest of the bunch. Both will be mounted together, one above the other. The final two paintings will be 24×12 inches, both mounted side by side. Wow, okay so now I will finally show you some pictures! 10×30 canvas, ready to be painted! Now I print out my reference images. 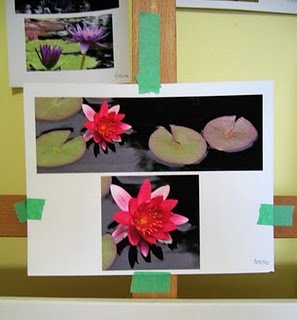 I usually print out a high resolution image on matte double sided paper and if there is a detail that appears too small on the overall print out, such as the waterlily, I will enlarge it. I like to mount my reference image to my easel, though sometimes I have to hold it in my hand if the canvas is too large 🙁 I prefer mounting it to the easel as I find holding the palette and a reference photo a tricky thing to do! I like to paint using water-soluble oils, though I have recently decided to buy pure oils since my favourite brand of water-soluble oils are no longer being carried at my local art store, boo 🙁 I thin my paint down using Walnut Oil. A good friend of mine, who is also an artist, told me that using Walnut Oil prevents yellowing in the future. So Walnut Oil it is! Now that everything is in place it’s time to transfer the image onto the canvas. Depending on what I’m painting, I usually try to make the transferred drawing as accurate as possible. I find that it helps me save time so that I can just concentrate on applying the correct colours and making the shapes work rather than concentrating on if the spacing is correct, etc…I will also adjust shapes as I paint but that usually is minimal if I’ve done my due diligence while in the transferring stage. Here’s the transferred image…what do you think? My next step is to let the paint dry, then I can start colour blocking using light washes of paint, though I might go straight into the background…not sure what I will do as of yet.